With over 45 years experience, Alpine Travel is the largest independently owned coach tour operator in North Wales, with a fleet of over 80 vehicles and 100+ employees. Situated in the beautiful seaside resort of Llandudno, within easy reach of the major international airports of Birmingham, Liverpool & Manchester, we can meet all your group travel needs. Our services include private charter coaches and tailor made tours of discovery across Wales & the UK, as well as hop on - hop off Sightseeing buses, heritage bus tours, and local tourist bus operations. Working with our professional tour planner our inbound group travel programme offers you the opportunity to have a tailor made group tour and well work with you to create a tour that is unique, memorable and exciting for your group, as well as making your role as hassle free as possible. 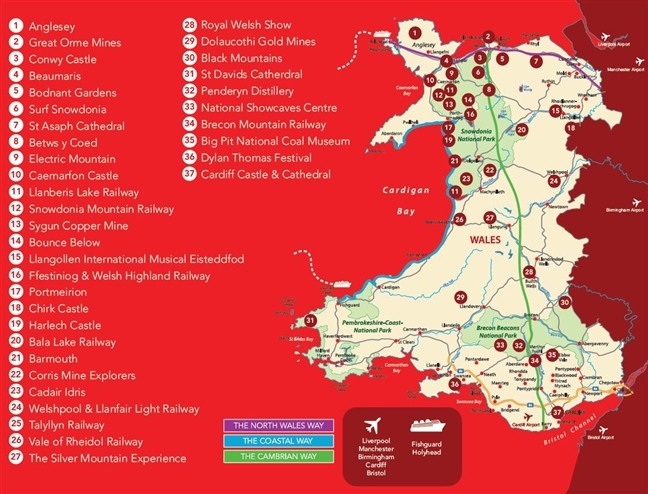 The itineraries we produce are planned with all your requirements in mind, whether you are looking to undertake a walking holiday, tour the beautiful coastline of Wales, or explorer the many castles, theres something for everyone. Not only that but we offer you exceptional hotel accommodation, luxury coach travel, professional courier drivers and a wealth of experience.  Groups with special interests. Our prices are very competitive and we welcome any opportunity to help you. Our group tours take in stretches of the 870 mile Wales Coast Path which passes seascapes of breath-taking variety, hundreds of beaches, harbours, inlets and islands. You can follow the rivers upstream to the inland shores of Wales lakes and reservoirs. Alternatively experience the unique culture and finest food and drink. Whichever you choose a warm Welsh welcome awaits you. Brimming with adventures, cultural identity, music, festivals, literature and more, everyone can get involved in the tours weve suggested here, from coastal tours to inland discovery tours. With accommodation, dinner and breakfast included as well as luxury coach travel and all transfers.  Welshpool & Llanfair Light Railway.  The Silver Mountain Experience. Wales has around 230 beaches and 50 islands. With 50 breath-taking Blue Flag beaches 98 impressive sites meet the standard of the prestigious Blue Flag, Green Coast Award and Seaside Award. The Snowdonia National Park with its wild landscapes and villages steeped in history is the first designated of the three national parks in Wales. It has breathtaking scenery, is best known for hiking and activity holidays as well as waterfall, lakes and world-class mountain biking as well as a vintage steam railway that climbs to the highest peak in Wales. Bounce Below is hidden underground in a 176 year old disused cavern, twice the size of St Pauls cathedral. A surreal experience unlike any other. Set in the Penrhyn Slate Quarry, ZipWorld Velocity is Europes longest zipline, set in the Penryn Slate Quarry it is the venue for two ziplines; the first a meagre 800m of torpedo speed and the second a 1600m Big Zipper. Wales has 870 miles of Coastal Path running the entire length of the shores. Opened in 2012 it has attracted international visitors praise as the worlds first continuous coastal path. Wales is home to the UKs only coastal-based National Park in Pembrokeshire. The Gower Peninsula was Britains first Area of Outstanding Natural beauty and has since been joined by the Isle of Anglesey, Llyn Peninsula. Cardiff, the Capital of Wales was once the busiest exporting port in the world, along with Swansea and other coastal locations Cardiff and Swansea have renewed their links with the sea at modern marinas and waterfronts.